I am really pleased to recommend this website which features 7 different ‘bibles unpacked’ and 4 different bible studies. The focus of each varies from non-Christian to pastor and various others in between. There has been an amazing amount of effort put in Paul to produce this resource, and the further you dig into it the more realize this. The first thing you will notice is the quality of design. All of his guides are very professionally laid out – making it easy and enjoyable to use. Secondly, the depth of content is astounding – the In Depth edition of the Bible Unpacked weighs in at just short of 1,400 pages! I expect there is something for everyone here, whether you are studying alone or in a group. The Unpacked Bible is split into 7 version. There is small elements of commentary within these, but most of the content is verses straight from the bible grouped into the relevant section for the area of study. Two-Minute Edition – Key Bible teachings for people “on the run”. Pocket Edition – A look at the Bible’s teaching for seekers of truth. Concise Edition – A look at the Bible’s teaching for new and young believers. Foundations Edition – A compilation of the Bible’s teaching for believers consolidating their faith. Intermediate Edition – A compilation of the Bible’s teaching for believers growing in the faith. Comprehensive Edition – A compilation of the Bible’s teaching for believers established in the faith. And then finally there is the in-depth. 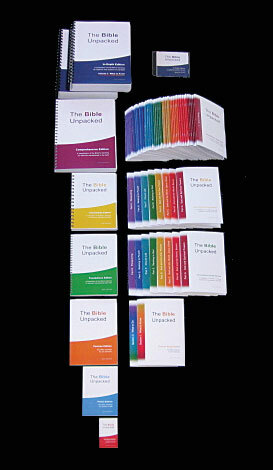 This is the most expansive of the Unpacked Bibles, and is a very useful study resource for anybody. It is laid out in chapters across doctrinal areas, and also has an index of topics and verses. I love the fact that it is so heavily weighted towards scriptures rather than commentary. This both helps you to learn the bible better, and also makes it a valuable tool when preparing sermons. There are also four study guides which complement the more comprehensive Unpacked Bibles. These include key verses, breif commentaries, and also questions to be discussed. Oh man…I am so excited that you shared this resource! I’m looking forward to using it. Thanks again! kindly send me a detail more. thanking you. May God Bless You More and more. not understanding anything entirely, but this paragraph presents nice understanding yet. We do have confidence in each of the ideas you’ve unveiled within your submit. They are genuinely begging all of which will certainly work. Nevertheless, a discussions are quite small for starters. May well you please expand these people a bit coming from the next occasion? Appreciate this post. They cannot be large or they would bind and stall from contact with the wood. generally have a safety harbor shield around the motor to prevent any mishap.